The sun can be a serious risk for drivers and their passengers, causing both skin cancer and pre-mature aging. Of all the forms of cancers, skin cancer is both the most common and preventable. SSO’s uncle died from skin cancer so this is a very personal concern for us. There are 2 types of harmful UV rays from the sun: UVA and UVB. UVA (think A for Aging) rays have a longer wavelength and cause more long term effects such as wrinkling and aging of the skin – and of far greater concern – skin cancer. UVA rays are year round, they are not temperature dependent or even impacted by weather as 80% penetrates the fog and clouds. UVB (think B for Burning) rays have a shorter wavelength and are the ones that cause sun burn … and skin cancer. Don’t the Windows Protect me from UV Rays? While car windshields typically block out UVB rays, studies show that they only partially block UVA rays. Side and back windows are not regulated and let these rays in. A study in the Journal of American Academy of Dermatology revealed that nearly 53% of skin cancers in the US occur on the left, or driver’s side of the body. UV exposure is 5 times greater on the left arm and 20 times greater on the left side of the face! This left-side sun exposure triggers sun damage, which can cause wrinkles, skin leathering, sagging and brown ‘age’ spots. The more time you spend driving, the higher the risk of skin damage. Research shows that all types of skin cancers are more common on the left side of the body. 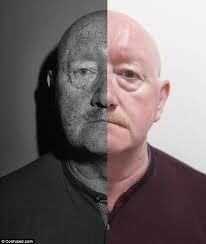 The man on the left shows the damage from the sun through a UV camera. 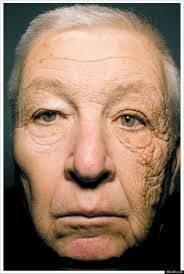 The man on the right is a driver in the UK whose right side of his face was damaged by the sun. Extreme yes, but they make the point clear. Open the roof and you can add the other side and the top of your head to your high risk areas. The breeze feels great but you may not realize just how strong the sun is until you are well and truly “lobstered” at the end of the day. 1. Wear an SPF 30 Broad Spectrum Sunscreen which protects against both UVA and UVB rays. a. Apply before getting into the car to your face, ears, arms, neck, & scalp. b. Keep some in your glovebox so it is at hand, especially for long trips. c. Reapply every 2 hours. 2. Wear SPF 30 Lipbalm. 3. Wear a hat, preferable a wide brim. 4. Wear Sunglasses with UVA and UBV filters to protect your eyes from cataracts and delicate skin around your eyes. 5. Long sleeved shirts are also a great option. 6. 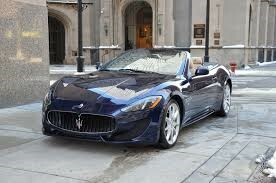 Consider closing your convertible hood between the peak sun hours of 10am to 2pm to avoid a major, direct sun hit. I highly recommend TropicSport sunscreen www.tropicsport.com. It is a natural mineral sunscreen with non-nano titianium dioxide and zinc oxide. TropicSport is free of toxic chemicals like oxybenzone and others you can’t even pronounce. It is free of avobenzone that all chemical sunscreens use to provide the UVA protection but that is the ingredient that also stain fabrics and leathers. What I love about it best is it meets the US FDA 80-minute and the Australian 4-hour water resistance torture test. Plus, unlike other mineral sunscreens, it does not leave a ghostly white glow.